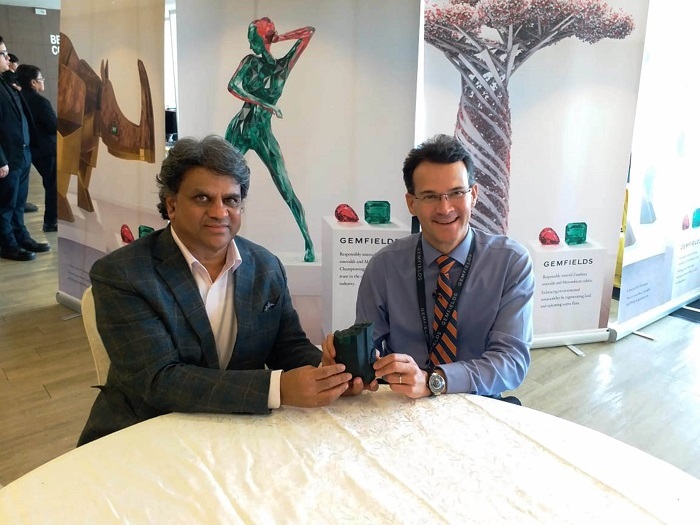 Gemfields is pleased to announce the results of an auction of higher quality rough emeralds held in Singapore from 14 – 17 November 2018. The emeralds were extracted by Kagem Mining Ltd in Zambia. Gemfields is pleased to announce the results of an auction of higher quality rough emeralds held in Singapore from 14 – 17 November 2018. The emeralds were extracted by Kagem Mining Ltd in Zambia (“Kagem”, which is 75% owned by Gemfields and 25% by the Industrial Development Corporation of Zambia). The proceeds of this auction will be fully repatriated to Kagem in Zambia, with all royalties due to the Government of the Republic of Zambia being paid on the full sales prices achieved at the auction. “Kagem and Gemfields believe coloured gemstones should be mined and marketed by championing three key values – legitimacy, transparency and integrity. We also believe that Zambia should benefit equitably from its natural resources through the taxes we contribute to the government, the foreign exchange earnings we generate, increased local employment, and the social impact of our community projects,” commented Sean Gilbertson – CEO – Gemfields. The auction saw 40 companies placing bids and generating total revenues of USD 28.4 million with an overall average value of USD 68.03 per carat. Improved liquidity in the trade customers in 74% of the offered carats being sold, versus 56% in the last auction of higher quality emeralds held in Lusaka in May 2018. Of the number of lots offered, 77% were sold (versus 59% in the May 2018 auction). Gemfields’ 30 auctions of emeralds and beryl mined at Kagem since July 2009 have generated USD 556 million in total revenues. The specific auction mix and exact quality of the lots offered at each auction vary in characteristics such as size, colour and clarity on account of variations in mined production and market demand. Therefore the results of each auction are not always directly comparable. “The results of what was our first Singapore emerald auction in more than three years clearly reflect the emerging recovery among our trade customers after a protracted period of difficulty. The marked increases in the percentage of carats and number of lots sold, combined with the uptick in per carat price, bode well for further improvement in 2019. ‘Inkalamu’, the extraordinary 5,655 carat ‘Lion emerald’ which captured international media attention following its discovery at Kagem on 2 October 2018, was purchased at the auction by Rajkumar and Rishabh Tongya of DiaColor, specialists in high-value gems. Gemfields, in furthering its support of wildlife conservation, is donating 10% of the proceeds of ‘Inkalamu’ to its conservation partners the Zambian Carnivore Programme (www.zambiancarnivores.org) and the Niassa Carnivore Project (www.niassalion.org). The Inkalamu emerald will deploy fully customised Gübelin ‘Provenance Proof’ nano-tagging, allowing the “descendants” of Inkalamu (or Inkalamu’s own ‘pride of lions’) to be traced directly to not only the mine of origin, but the gem of origin. Gemfields is a world leading supplier of responsibly sourced coloured gemstones. Gemfields is the operator and 75% owner of both the Kagem emerald mine in Zambia (believed to be the world’s single largest producing emerald mine) and the Montepuez ruby mine in Mozambique (one of the most significant recently discovered ruby deposits in the world). In addition, Gemfields also holds controlling interests in various other gemstone mining and prospecting licenses in Zambia, Mozambique, Ethiopia and Madagascar. Gemfields’ outright ownership of Fabergé – an iconic and prestigious brand of exceptional heritage – enables Gemfields to optimise positioning, perception and consumer awareness of coloured gemstones, advancing the wider group’s “mine and market” vision. Gemfields has developed a proprietary grading system and a pioneering auction and trading platform to provide a consistent supply of coloured gemstones to downstream markets, a key component of Gemfields’ business model and has played an important role in the growth of the global coloured gemstone sector. Further information on Gemfields Group Limited can be found at www.gemfieldsgroup.com.